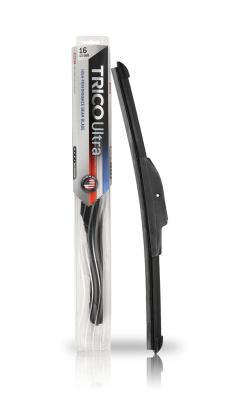 All-New TRICO Ultra wiper blade is designed to withstand the most severe weather conditions. Equipped with an innovative end cap to help protect against ice scraper damage. Quick and easy installation makes the new TRICO Ultra the best solution for optimal visibility whatever the forecast. TRICO Ultra high performance beam blade that lasts longer. Swift Easy connection technology makes this blade simple to install. Vortec aerofoil converts wind force for maximum windshield contact and clears the glass at every speed. Exclusive twin point coupler technology provides more consistent pressure over life of the wiper system. Chamfer-edge end cap design helps protect against ice scraper damage. 13-260 - TRICO Ultra® Wiper Blade 26" 13-190 - TRICO Ultra® Wiper Blade 19"